By default, Pozi will display layers using generic colours and symbols. Here are options to make your layers more meaningful to users. Map layers of a small number of point features are best represented by vector points. Most browsers can handle up to several hundred vector points. Vector points enable features to be represented by clickable symbols that are visible at any scale. Send Groundtruth the link or name of the icons and the colours you want to use, and we'll configure it for you. If you want different colours/symbols for different classes within the layer, provide a simple list of all the class values with the desired symbol and colour. WMS is the ideal publishing format for layers with hundreds of features or large regions. Organisations can control how WMS layers are rendered by data.gov.au by creating a style file and sending it to Groundtruth for publishing (see Publishing section below). 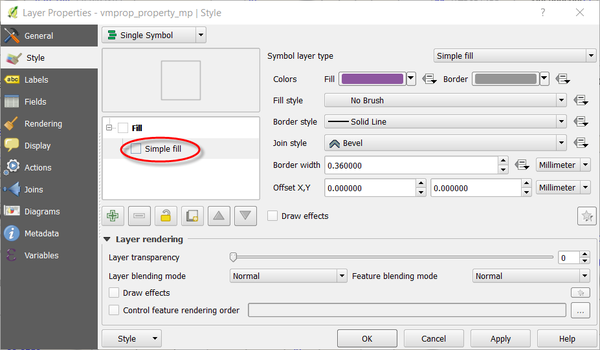 This dialog is showing styling of a Single Symbol, but there is also the option to create multi-symbols thematic maps by using the Categorised, Graduated, or Rule-Based symbolism. Polygons with no fill appear to be rendered by OpenLayers as a border only, with an unselectable hollow centre, ie. the only way to select the polygon is to select somewhere along the border. This is obviously not the desired functionality. In this circumstance it is suggested that when styling a polygon in QGIS to always apply a fill to the polygon layer, with a 0.01 opacity, such that it is effectively transparent but has a selectable centre. With the introduction of QGIS 3, labelling configuration created within QGIS is included within an exported SLD. 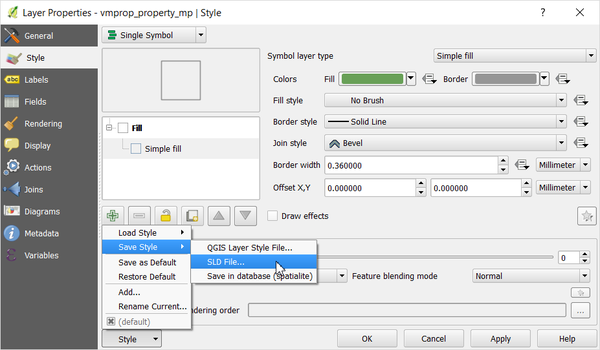 (Previous versions of QGIS do not export any label configuration to the SLD file). If you require labelling it will be necessary to use QGIS 3 when creating your SLD. You may also wish to change the font and font size. `DejaVu Sans` is recommended for labelling. It is a 'sans serif' font, which means doesn't have tails at the end of the strokes, making it more legible on a map. When you have a new SLD file, send it to Groundtruth.